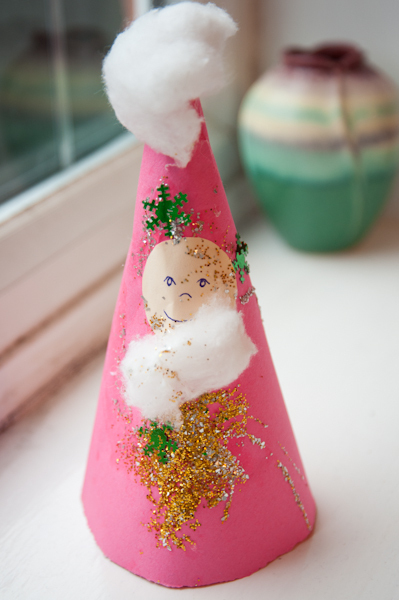 This week at toddler group we made Santa models with a cone shape. Cut the semi circle out and roll the sides round on each other to form a cone, then glue in place. 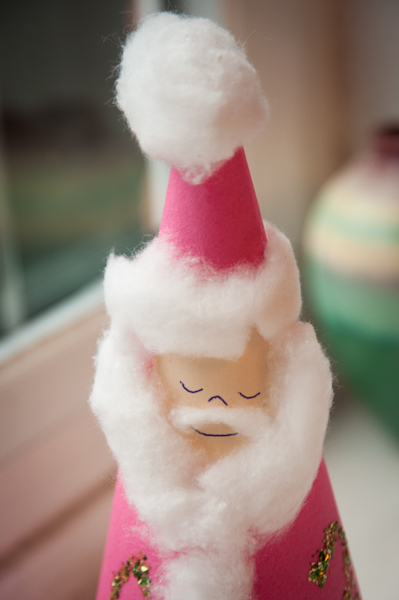 Cut a small circle from the skin coloured paper/card, then using a pen draw a little face. I drew 3 different designs for toddler group today so that the children had a choice. Glue your face onto the cone, close to the top, but leaving enough of the point to act as the hat. 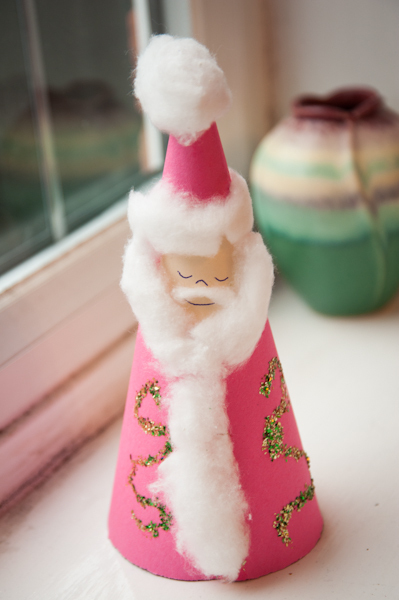 Glue cotton wool to the tip of the cone, around the cone above the face for the hat edge, around the sides and bottom of the face for the beard, down the centre front for the the fur coat trim and a tiny little bit on the face for a moustache. 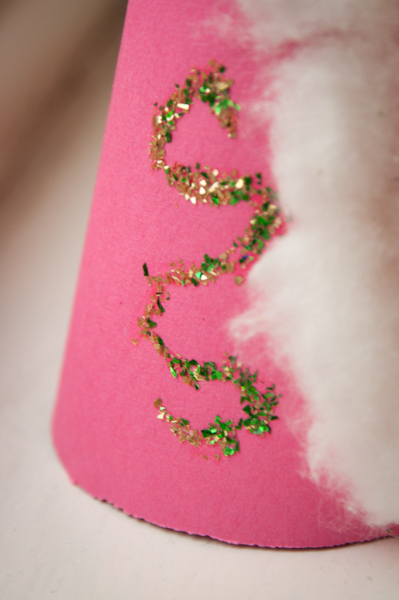 Glue you decorations on where you like and draw patterns with glue,then sprinkle with glitter. And this little guy is the Smaller Person's creation. 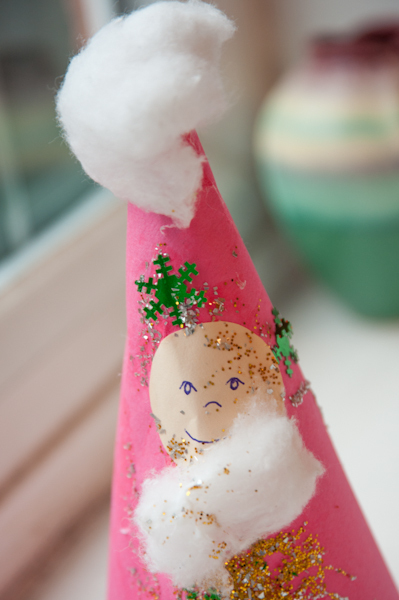 You could add sting to the top of the cone so that you can hang it, you could make a larger version using card as the base, and attaching some elastic for a chin strap so that you make a Christmas party hat. for extra detail you could cut some little mitten shapes out of coloured paper, stick them on and trim the cuff with more cotton wool (I was a bit too short on time to cut out the little gloves this time). This would also work for Mrs Claus, Elves, Reindeer, Angels, and Snowmen. You could even make up an entire Nativity scene!